The Malti Poo is a cross between a Maltese and a Toy Poodle. Like many Poodle crossbreeds, it is known by many names, such as Malte Poo, Malta Poo, Multa Poo, Moodle, Malti Doodle, Maltese Poodle, or even Malt Oodles. Unlike other Poodle mixes, the Malti Poo cross is made to create a distinct appearance, rather than to provide the Poodle’s hypoallergenic coat, as the Maltese itself sheds little and is good for allergy sufferers. As a crossbreed, the Malti Poo is not eligible for registration with purebred registries such as the American Kennel Club, but it can be registered with the American Canine Hybrid Club as Malt-a-Poo. Some breeders produce Malti Poos by crossing a purebred Poodle with a purebred Maltese (called a first generation cross), but others allow crossing Malti Poos with Poodles or Maltese (called a backcross), or other Malti Poos (called a multi-generation cross). Different crosses can result in different characteristics. The Malti Poo has won over celebrities and the masses alike with its distinctive charm. Jessica Simpson’s Malti Poo ‘Daisy’ was featured on the reality TV show ‘Newlyweds: Nick and Jessica’. Other celebrity Malti Poo owners include Ellen DeGeneres and Carmen Electra. The Malti Poo comes in a wide variety of sizes, but most are 6-15 in (15-38 cm) at the shoulders and weigh 5-15 lbs (2-7 kg). A Malti Poo with more Maltese influence will have a domed skull, whereas a Malti Poo with a higher Poodle influence will have the long, narrow muzzle characteristic of Poodles. The Malti Poo coat can range from the silky texture of the Maltese coat to the Poodle’s distinctive frizzy coat. It can be many colors including grey, black, white, and apricot. Most Malti Poos shed little or none and are a good match for allergy sufferers. Many Malti Poos are kept in a short ‘puppy cut’. Some Malti Poos are kept with a longer coat, with the hair tied in a bow above the eyes. The Malti Poo is an intelligent, loving dog. The mix of Maltese and Poodle usually produces a lively, playful dog devoted to its family. The Malti Poo loves to play or curl up on the couch for a nap. Malti Poos require frequent human companionship. The Malti Poo is an intelligent, loving dog. The mix of Maltese and Poodle usually produces a lively, playful dog devoted to its family. The Malti Poo loves to play or curl up on the couch for a nap. Malti Poos require frequent human companionship. The Malti Poo can get along well with dogs and other pets if socialized when young, but it is somewhat territorial. Malti Poos may be wary of strangers and are highly protective of their family. Malti Poos get along very well with children, but should be supervised around young children to ensure they are treated respectfully. You can find Malti Poo puppies priced from $324 USD to $4500 USD with one of our credible breeders. Browse through our breeder's listings and find your perfect puppy at the perfect price. The Malti Poo can get along well with dogs and other pets if socialized when young, but it is somewhat territorial. Malti Poos may be wary of strangers and are highly protective of their family. Malti Poos get along very well with children, but should be supervised around young children to ensure they are treated respectfully. The Malti Poo sheds little or no hair. It requires monthly grooming and regular brushing to prevent tangling. The eyes and ears should also be cleaned regularly with stray hairs removed. Bathe only when necessary. Puppies should not be handled constantly as they need time to rest and relax. The Malti Poo has a lifespan of 11-13 years. Malti Poos may be susceptible to health problems affecting the parent breeds, such as heart issues, dental problems (frequent tooth brushing can help), and bloat, though they are somewhat less likely to suffer these conditions then purebred Poodles or Maltese (known as ‘hybrid vigor’). Bloat can be prevented by feeding from a raised dish, spacing meals throughout the day, and avoiding exercise immediately after meals. The Malti Poo is eager to learn and should not present many difficulties in training. Positive reinforcement is likely to be the most successful approach. This breed may take a while to house train. Like the Maltese, many Malti Poos are paper or box trained rather than ‘outdoor’ trained. The Malti Poo can have most of its exercise needs met by indoor play and activities, but it also enjoys walks or playtime in the yard. The Malti Poo is an excellent breed for apartment life. Malti Poo Puppies for Sale - Shipped Worldwide! Finding the right Malti Poo puppy can be dog gone hard work. PuppyFind® provides a convenient and efficient means of selecting and purchasing the perfect Malti Poo puppy (or Malti Poo puppies) from the comfort of your home, 24 hours a day, 7 days a week. Take advantage of our PuppySearch or leisurely browse our directory of hundreds of dog breeds, Malti Poo dog breeders, Malti Poo dogs for adoption, and Malti Poo puppy for sale listings with photos and detailed descriptions. 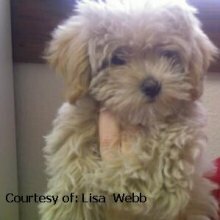 Some Malti Poo puppies for sale may be shipped Worldwide and include crate and veterinarian checkup. Many Malti Poo dog breeders with puppies for sale also offer a health guarantee. With thousands of Malti Poo puppies for sale and hundreds of Malti Poo dog breeders, you're sure to find the perfect Malti Poo puppy.